The problem with a sandwich cookie is that you think of it as one cookie, but when you eat two you're actually eating four cookies plus the filling. My limit is three cookies in one sitting. Back in April, my mom picked up a Cook's Illustrated magazine that what looked like a great recipe for peanut butter sandwich cookies. 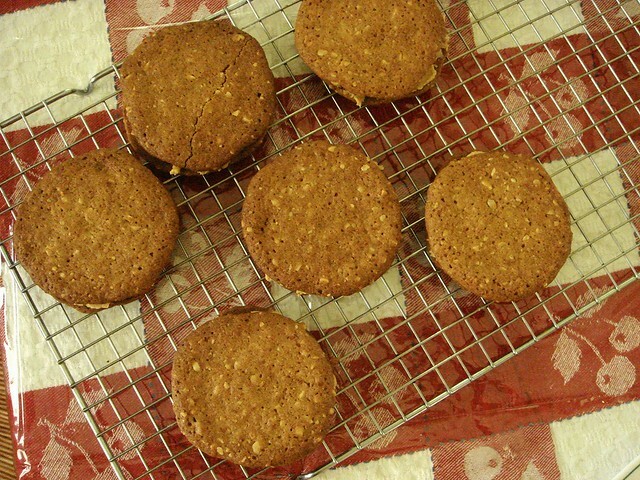 The crisp, thin cookies are sandwiched with a tasty peanut butter filling, and both the components are easy to make. 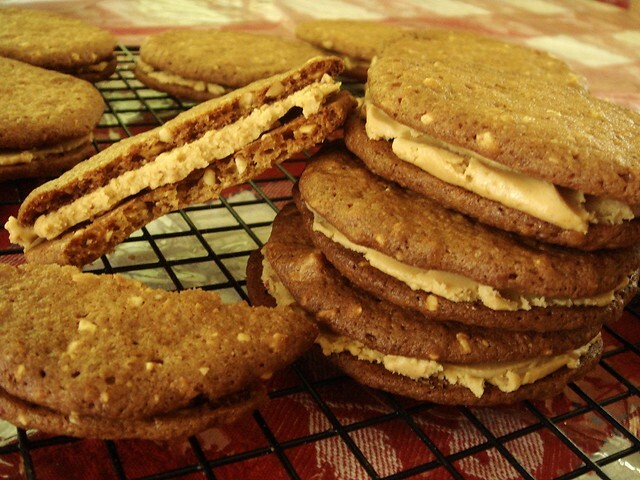 Besides peanut butter, the dough also has ground peanuts, giving the cookies more depth of flavor. The filling reminded us of Reese's Peanut Butter Cups. Everything combined makes for one tasty cookie. 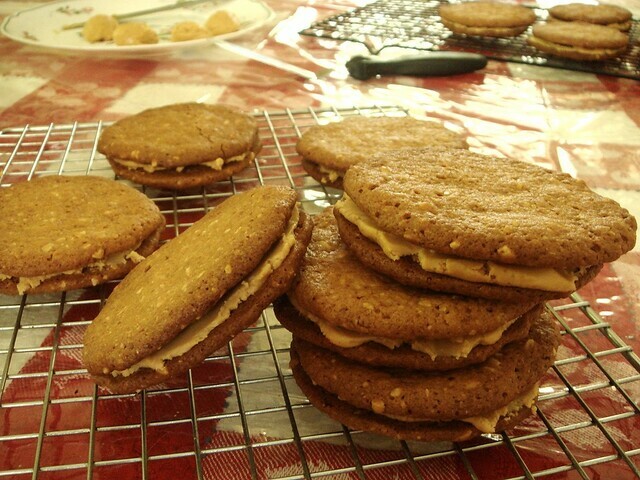 Since I didn't have regular peanut butter, I used natural peanut butter in both the cookie dough and filling. I added a few extra tablespoons of flour and shortening so the dough wouldn't be too soft. As it is, the dough is pretty slack, but it needs to be in order for the cookie to bake up thin and crisp. After baking two sheets of cookies, I decided that 350 degrees was just too high, even when I baked them less than required. The edges were a little too dark and almost looked burnt, so I lowered the temperature to 325 degrees and baked them for 15 minutes. The cookies were still thin and crispy, but looked golden brown. Look at these tasty cookies! The cookies are a little crumbly when you bite into them, but it sticks together thanks to the creamy filling. Irresistible. I had 1.5 cookies. Preheat oven to 325°. Line a baking sheet with parchment paper. Pulse peanuts in food processor until finely chopped. Whisk flour, baking soda, and salt together in a bowl. 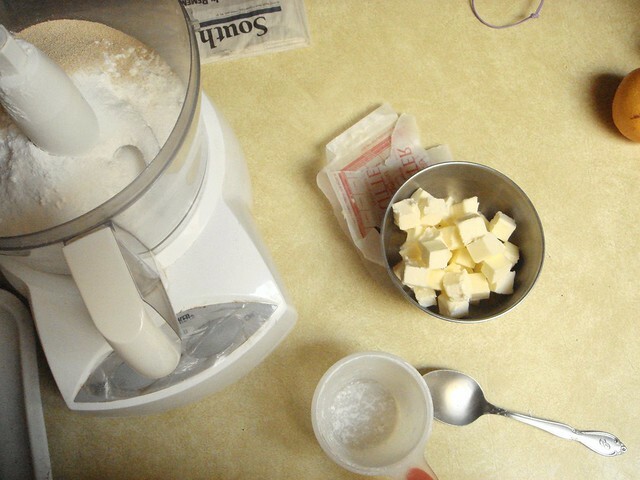 Whisk butter, peanut butter, granulated sugar, brown sugar, milk, and egg together in a second bowl. Stir flour mixture into peanut butter mixture with a rubber spatula until combined. Stir in peanuts until evenly distributed. Using a tablespoon measure, place 12 mounds, evenly spaced, on the prepared baking sheet. Using a damp hand, flatten mounds until 2 inches in diameter. Bake until golden brown and firm to the touch, 15 to 18 minutes. Let cookies cool on sheet for 5 minutes. Transfer cookies to wire rack and let cool completely, about 30 minutes. Repeat portioning and baking remaining dough. For the filling: Microwave peanut butter and butter until butter is melted and warm, about 40 seconds. Using a rubber spatula, stir in confectioners' sugar until combined. To assemble: Place 24 cookies upside down on work surface. Place 1 level tablespoon warm filling in center of each cookie. 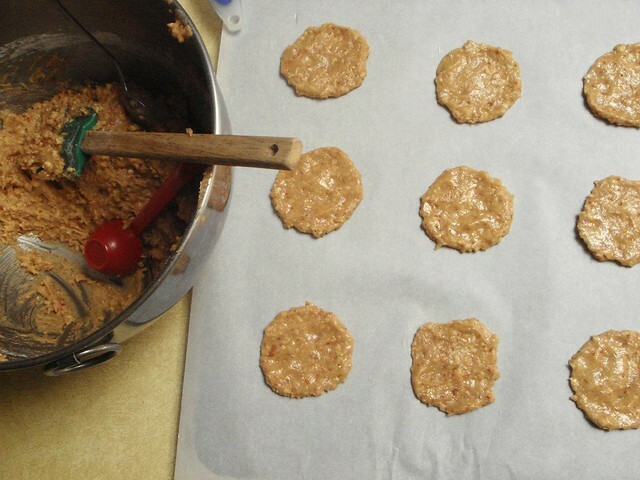 Place second cookie on top of filling, right side up, pressing gently until filling spreads to edges. Allow filling to set for 1 hour before serving (I didn't). Assembled cookies can be stored in an airtight container for up to 3 days. I spent most of the day in Chicago on Thursday with my brother and Mom. We initially went to race the Jim Gibbons 5k, only since I hadn't been running it was just my brother racing this time. 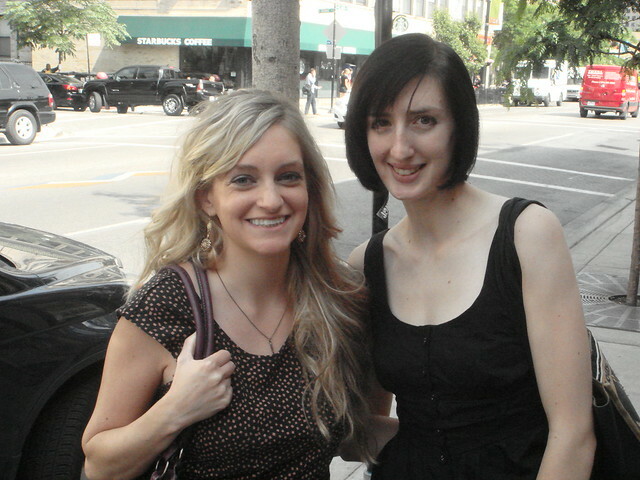 Before the race, I met up with Sugar Plum (in real life, I called her Emily) for a cupcake at Molly's Cupcakes. 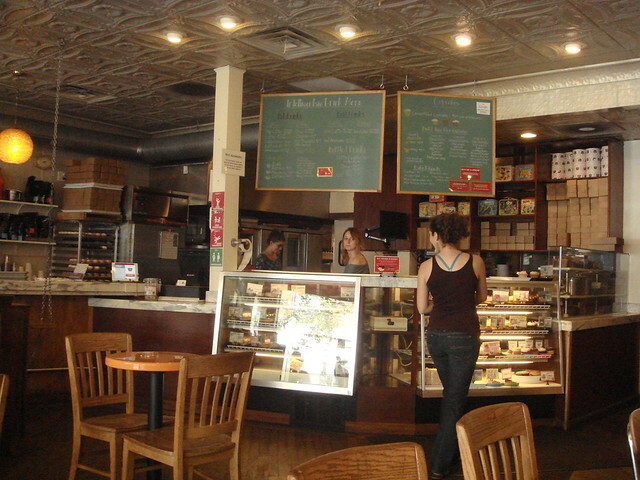 At a mere two dollars for a standard cupcake, it's the best priced 'cake around. What I like about Molly's is that you can choose your own frosting. 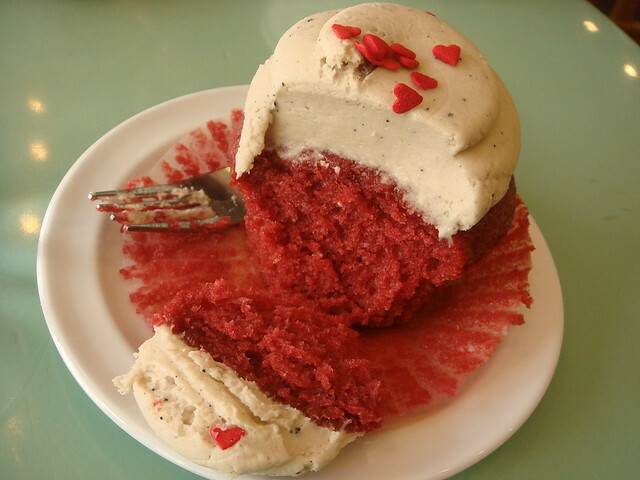 I ordered a red velvet with brown butter frosting. They also have a sprinkle bar and free water! The cupcake was nice and moist with a hint of tanginess. I loved the frosting, though it was rather sweet. During our goodbyes, we took a picture for proof. (Just call me the shadow lady from Seinfeld, why don't you.) 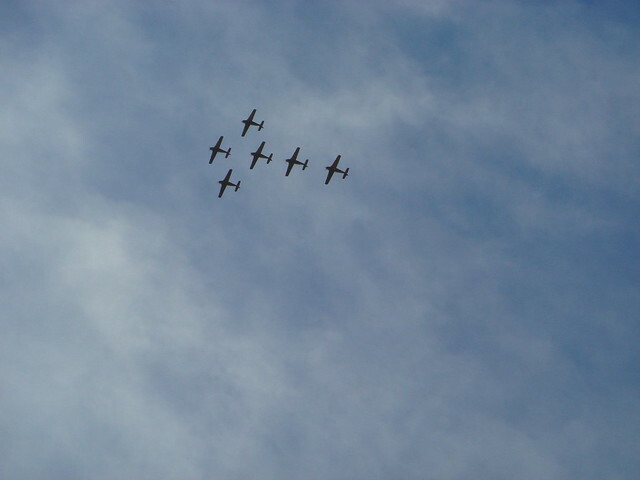 Then, my family and I made our way to Lincoln Park for the race. 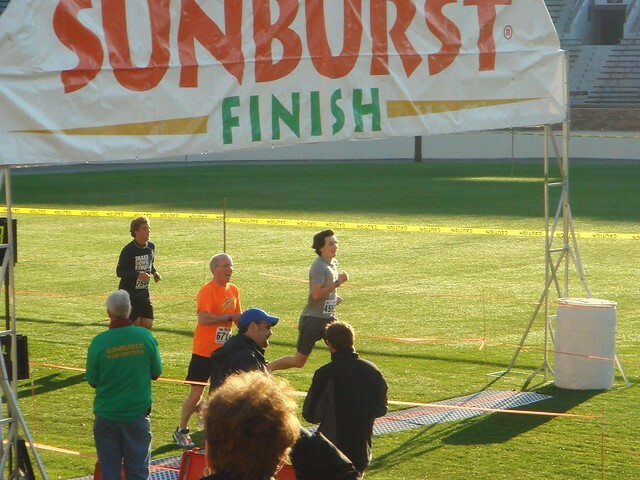 Here is my brother finishing the 5k. Look at his epic hair. 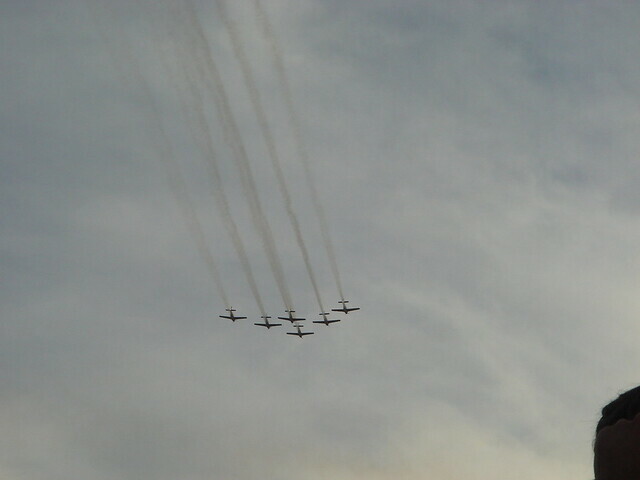 Post-race air show. I'm surprised I managed to take the camera out in time to snap a few shots. Then we ate dinner, but I didn't take any pictures of that. 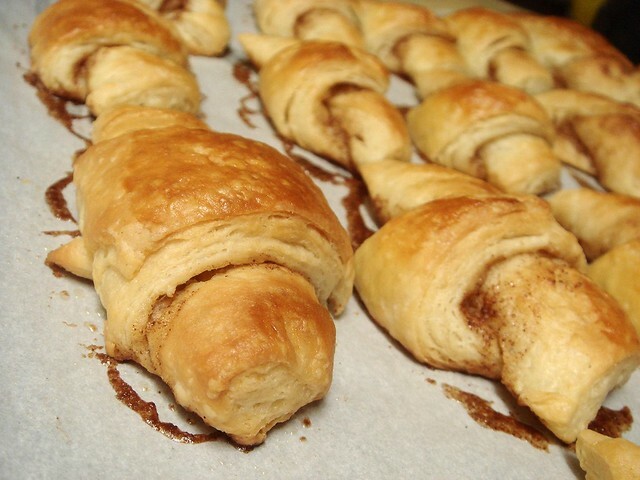 Laminated dough has always been the pinnacle of baking to me, which is probably why I've been scared to try it. But when I came across a 20 minute croissant dough from The Boy Who Bakes, I figured I put it off long enough. The traditional way to make croissants is to make a yeast dough, roll it out, and place a butter slab thing on top. 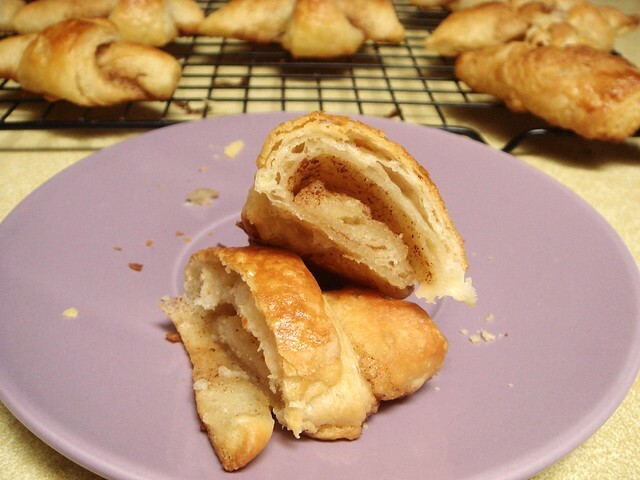 It's then covered with the dough, rolled, and turned multiple times to create the thin, flaky layers. Edd's version can be made in a food processor. Chilled butter is pulsed into the flour mixture and refrigerated overnight before beginning the rolling and turning process. Easy enough, right? It certainly was easy. Between turning, I refrigerated the dough 25 minutes to keep it chilled. This also seemed to relax the gluten, making it easier to roll the dough out. After the third turn, the dough lost its raggedy edges and was pretty smooth with visible butter chunks remaining. Then, my lack of technique came into play. 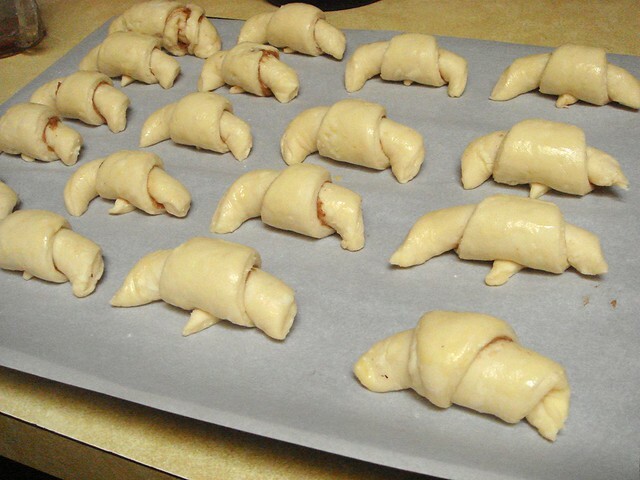 I didn't roll the dough out wide and long enough, so the croissant triangles were smaller and didn't have as many rolls when shaped. I think that's why my croissants puffed out too much. Also, instead of leaving them plain, I brushed each piece of dough with a butter cinnamon-sugar filling left the insides a little soggy. 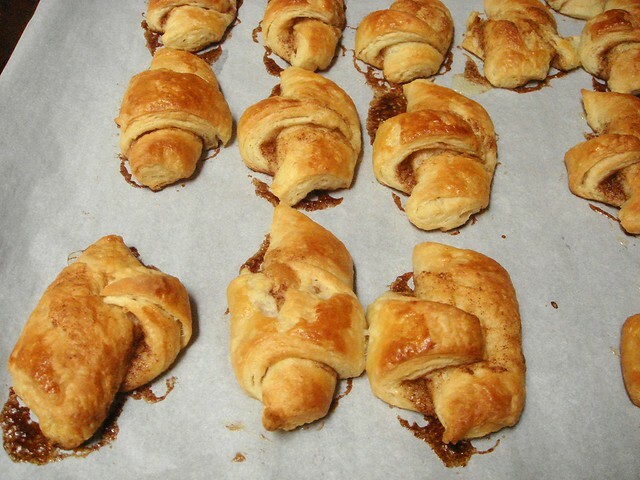 As Edd noted in his recipe, the croissants don't appear to proof very much, but they do expand while baking. While I didn't miserably fail my first attempt, my croissants leave much to be desired. They're a little flaky but nothing like a real croissant. Armed with just a little bit of experience, I hope my next attempt is a little better. Until then, I'm off to meet up with Emily from Sugar Plum Blog. It's been about 1 1/2 years since I last ate chocolate mousse. Micki made it for me and it left a lasting impression. 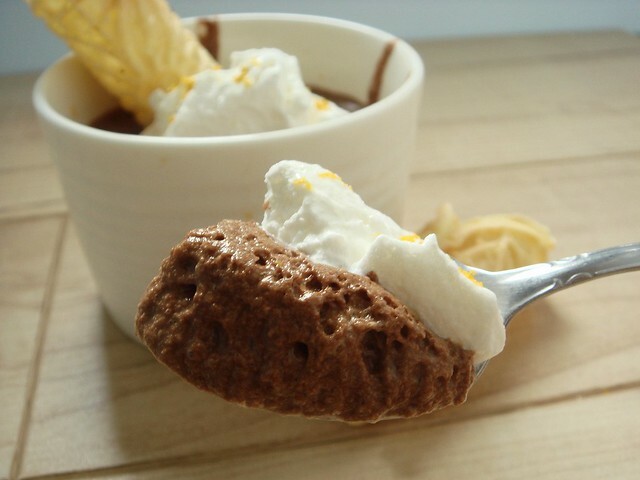 Mousse, unlike custard and pudding, requires no cook time and has a very silky, spongy texture. Depending on the type of chocolate you use, it can taste pretty rich. I used half semisweet and half bittersweet. Wowee. I remember all of that, yet I've never bothered to make it myself. Forget about the simplicity of brownies, mousse is the easiest dessert of all time. As an added bonus, it requires no bake time and ingredients you most likely have on hand. Eggs, chocolate, extract, hot coffee. Got all of those? Here's how to do it. In a blender (or a bowl with a whisk, like I used), pour hot coffee over the chips, blending (or whisking) until melted. All that blending cools the mixture down for the next step. Whisk in the yolks and liqueur or extract into the chocolate mixture until thick. Pour the chocolate over the whites and fold until blended. Pour into serving dishes for a fancy presentation, or into one big serving bowl. Although you don't have to bake mousse, you do need to chill it for at least an hour prior to digging in. Good things come to those who wait. 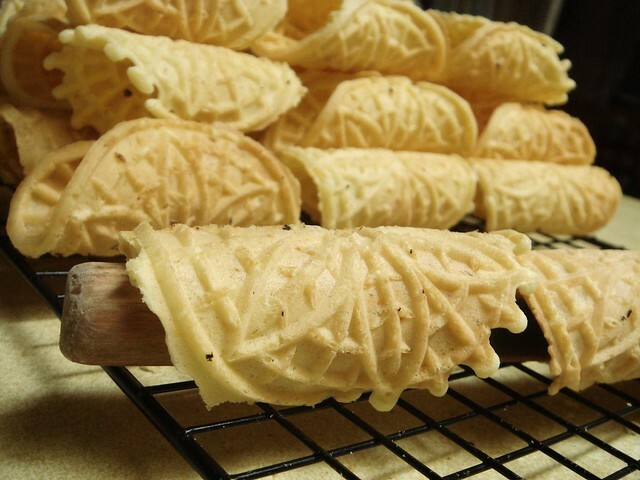 To keep busy, I made orange-flavored pizzelles to dip into the mousse. Wow, that little maker gets hot; you'd have thought the oven was on! And that, folks, is how you make mousse. 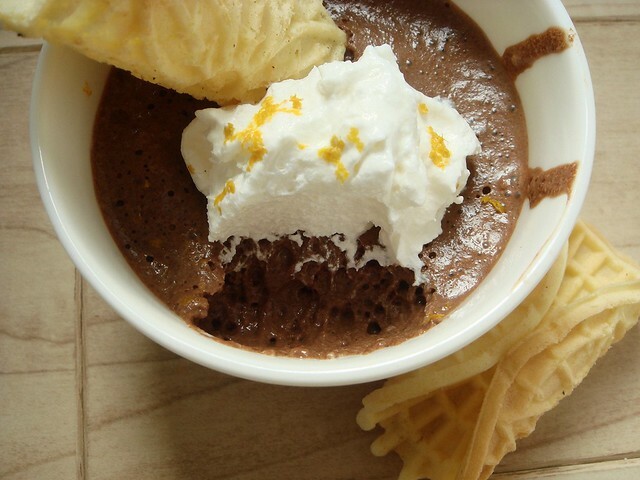 If you're a guy, this should be your go-to dessert to impress family, friends, and dates. 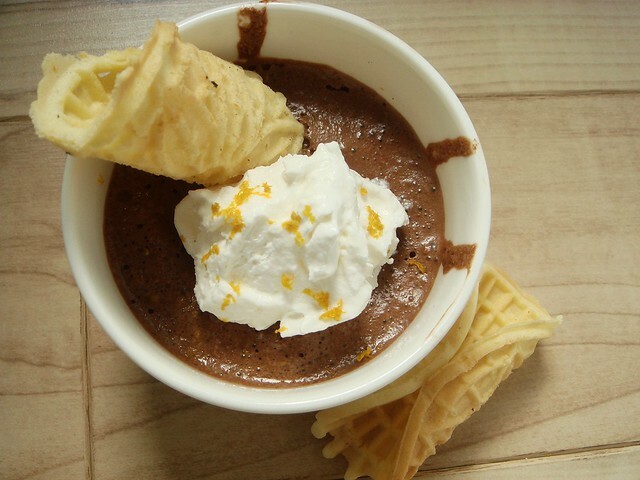 For everyone else, you'll still impress everyone with this dessert. I mean, I impressed myself. Disclaimer: If you're young, pregnant, or elderly, you might want to steer clear of this dessert unless you use pasteurized eggs. Put the chocolate in a medium bowl and pour the hot coffee over them. Whisk until mixture is very smooth. If necessary, add the additional hot coffee to melt any remaining chips. Whisk again for another few seconds. Separate the eggs, putting the whites into a large metal bowl with no traces of grease and the egg yolks into the chocolate mixture. Set the whites aside. 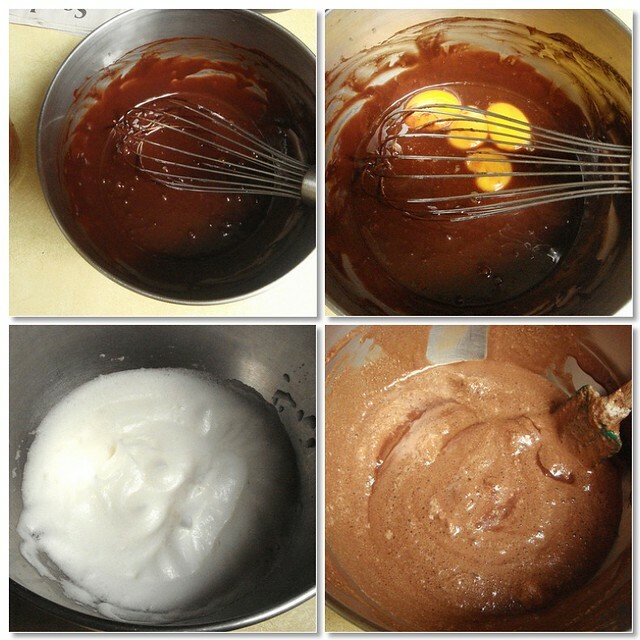 Add the vanilla or liqueur to the chocolate mixture and whisk for 15 seconds, or until the mixture is thick and smooth. Beat the egg whites with an electric mixer just until they form stiff peaks. Do not overbeat. Pour the chocolate mixture over the beaten egg whites and mix them gently with a rubber spatula, scooping up egg white from the bottom of the bowl and turning the spatula over repeatedly until no white is visible. 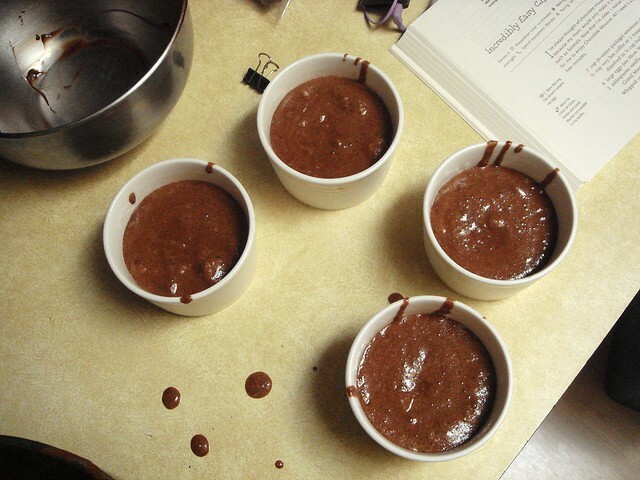 Pour the mousse evenly among six small dishes or into one serving bowl. Cover with plastic wrap and refrigerate for at least 1 hour or overnight. Serve plain or with whipped cream. Store leftovers, covered, in the refrigerator. I haven't been feeling all that great lately. Not being able (and now not caring) to run has a lot to do with it. Because of that, my inspiration to bake was waning until a cookbook I ordered arrived. Chocolate On The Brain: Foolproof Recipes for Unrepentant Chocoholics is an old favorite of mine. I found it at the library one day and kept renewing it as often as I could until the book was no longer available. Yeah. What I like the most is the humorous stories, little tidbits of chocolate history, and "mom hints" to ensure success. It's like a story, and that's the best kind of cookbook. The book starts with an introduction by Kevin Mills, the author, who lets you know right from the beginning that he doesn't trust you if you say you hate chocolate. Along with the standard issue index, there's a secondary index for "Quick Relief for Chocoholics" that divides the recipes by how quickly you need a chocolate fix. 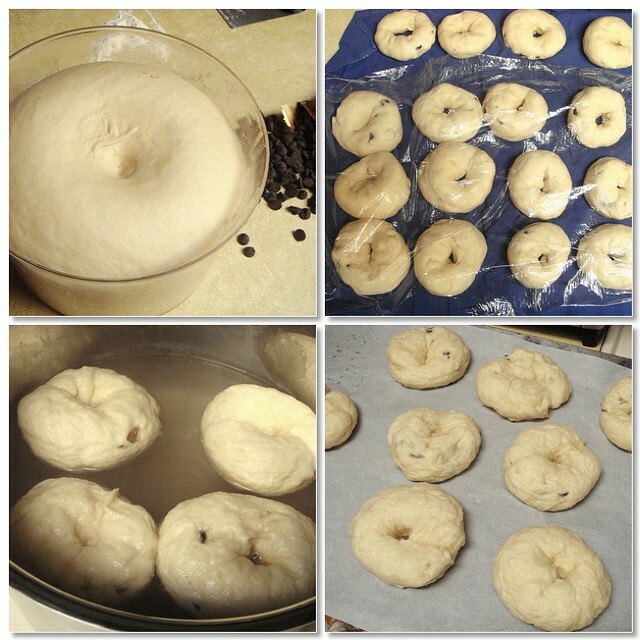 The recipes are all given skill levels ranging from very easy, easy, and not so easy, like these bagels. (But they're easy, honest.) Even if you don't liken chocolate to oxygen, this is a worthwhile book to have. 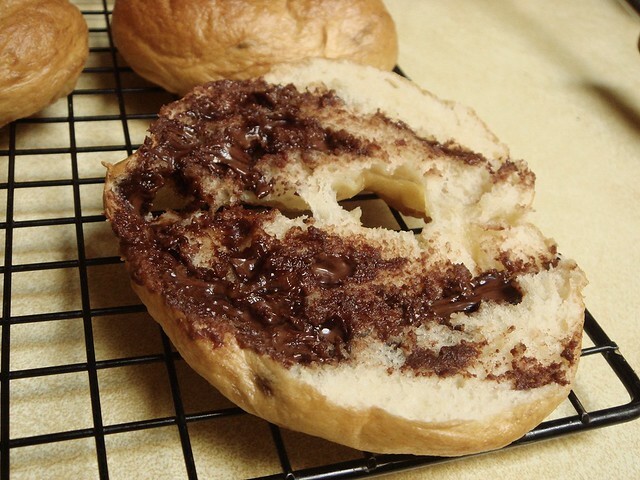 One of the first recipes I ever made from Chocolate On The Brain was the chocolate chip bagels. I remember them being easy and the most delicious thing I've ever made. That distant memory prompted me to make them again, so yesterday I kneaded my angst away until it transformed into smooth, silky dough. After the dough had risen, I shaped sixteen bagels into rings and was about to plop them into a giant pot of boiling water until I noticed that I never turned the oven on. Oops. Due to the error, the bagels (I keep typing 'doughnuts') rose a little more than intended. I don't think it bothered the bagels, any. Before you ask me why I think it's okay to eat chocolate chip bagels for breakfast, let me tell you that it's no different than many people's bowl of oatmeal. Really, oatmeal is just a vessel for brown sugar and although I like to eat brown sugar, I can make do with chocolate. Other than the chips, the dough in enriched slightly with half a stick of butter and one egg. There's a measly two tablespoons of sugar (I'd use brown sugar next time). You could even replace half the flour with white whole wheat, but why bother. Right? Just enjoy the deliciousness. 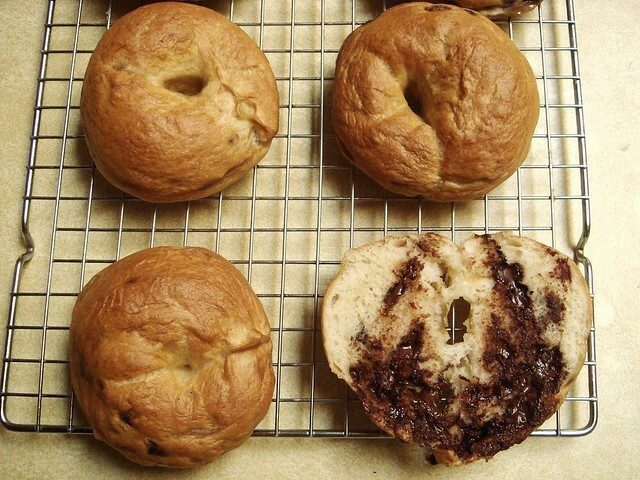 To shape the bagels, knead one tablespoon chocolate chips into each portion of dough. 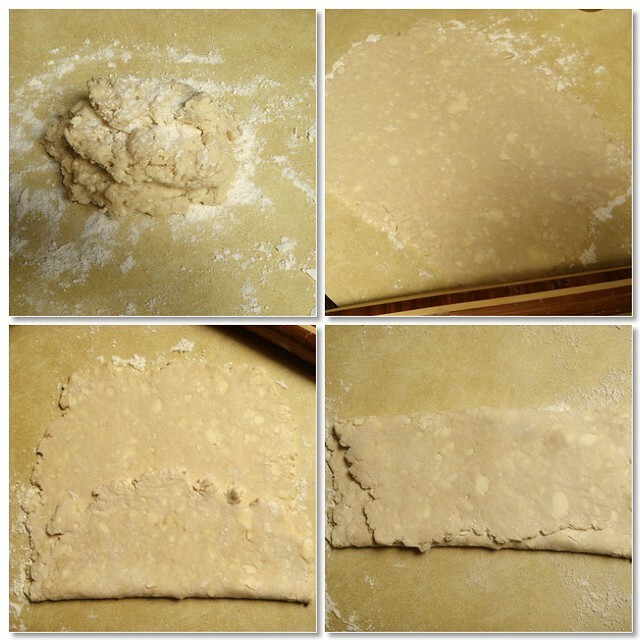 After rolling the dough into a log, overlap the ends and pinch tightly. If it's not tight enough, the ring will separate in the water. It happened to me once. As for my bagel skills, this was one of my better efforts. The bagels were still rather dimply, but not as flat as the last time I made bagels. And that's why I looked forward to this recipe - simple, easy, and successful. 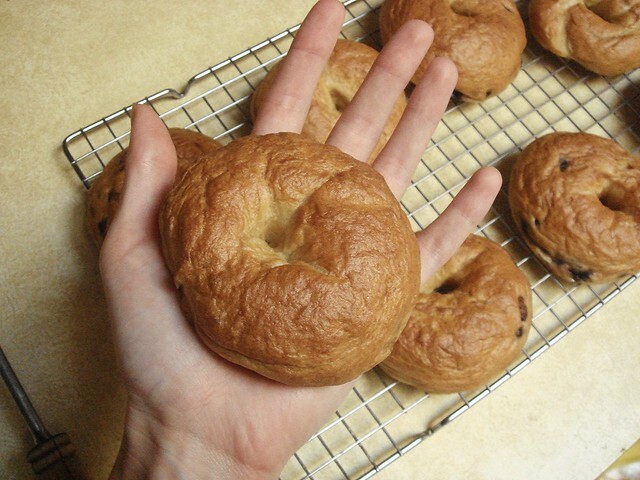 - These bagels aren't as mini as you might expect. As you can tell in the above picture, it's about the size of my palm. I'm thinking each bagel is 2-3 ounces, but I didn't weigh the dough and can't be certain of that. I think they're the perfect size. Once the first batch had cooled just barely, I sliced into a bagel. The chips were still warm and smeared themselves as the bagel was sliced. See all that chocolate? No, I didn't knead the chips in very evenly; it doesn't matter where the chocolate is, just that it's there. I was entirely satisfied after eating it, and for a brief moment life seemed a little bit brighter. I ate another one, toasted, this morning with coffee. I can't say it gave me an epiphany, but it made me happy. Melt the butter in a small pot over low heat. Set aside to cool. Heat the water to 100-110 degrees. Pour the water into a large bowl. Sprinkle the sugar and yeast into the water, and stir for a few seconds until the yeast dissolves. Let the mixture sit for about 5 minutes, or until it becomes frothy. Beat the egg and add to the mixture. Add the butter and mix to incorporate. Add 3 1/2 cups flour and the salt (and wheat gluten), and mix with a wooden spoon. Sprinkle 1/2 cup flour onto a dry, clean work surface and carefully transfer the dough onto the flour. Knead the dough by folding it over and over on itself while pushing it with your hands for 8 to 10 minutes, gradually adding more flour as necessary, 1/2 cup at a time, until the dough is smooth and satiny. Pour 1 teaspoon oil into a large bowl, and spread around with a paper towel, making sure to grease the sides as well as the bottom. Place the kneaded dough in the bowl and turn over so that the top is greased. Cover the bowl with a clean towel and set aside on the counter for the dough to rise for 1 hour. When it has risen, fill a large pot at least half full with water, cover, and begin heating over high heat. Place one oven rack on the second highest position and the other in the bottom position and preheat the oven to 400°. Line two baking sheets with parchment paper. Set aside. Take the risen dough out of the bowl, knead a few times to get the air pockets out, and divide into 16 equal pieces. Spread a clean tea towel on the counter. 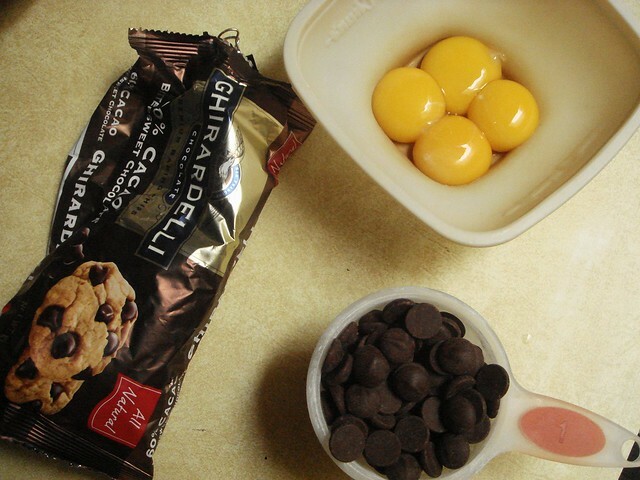 Take 1 piece of dough and 1 tablespoon of the chocolate chips and knead them together. Then roll the dough between your hands into a cylinder about 6 inches long and 1/2 inch thick. Overlap the ends and pinch together tightly to make a ring. 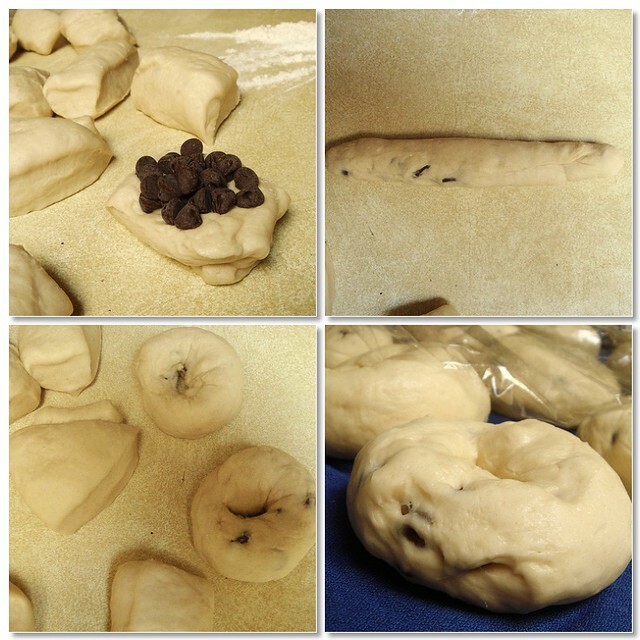 Or simply make a 1-inch hole in the center of the dough, and shape into a ring. Make sure the chocolate chips are not exposed. Lay the ring on the tea towel and cover. Repeat the process until you have 16 rings. When the pot of water has come to a boil, gently pick up a dough ring and drop it into the water. Drop 3 more in, one by one, and let cook for about 1 minute. They will puff up and double in size. Gently turn them over with a metal spatula and let cook for another minute. Transfer the bagels with a slotted spoon to one baking sheet and boil another 4 rings. Transfer those to the same baking sheet and bake on the top rack for 15-20 minutes, or until the tops are golden brown. While the first batch is baking, boil the second batch, as before. Transfer them to the second baking sheet and begin baking them on the bottom rack of the oven. When you remove the first baking sheet from the oven, transfer the second sheet from the bottom to the top rack to finish baking. The bagels will brown better on the top rack. When the bagels are done, remove from the oven and transfer to a rack to cool. Serve warm or at room temperature, or reheat for 5 minutes in a 350° oven. Store in the refrigerator in an airtight container or wrapped in foil or plastic wrap. A few weeks ago, I was contacted by a Gatorade rep who asked me if I'd be interested in reviewing Gatorade's new G Series Energy Chews. Having tried them before, I welcomed the opportunity and was looking forward to analyzing them a little more closely. If you aren't familiar with Gatorade's new products, they've created series to fit into every athlete's life. G Series is for athletes who need an edge during training and competition. This line includes the 01 Prime, which includes the carb and B vitamin energy chews that are taken prior to a workout or competition. The chews come in three different flavors and contain 25 grams of carbohydrates per serving, 90 mg of sodium, 30 mg potassium, and 20% of your daily value of B vitamins that help break down carbs into fuel (according to their website). B vitamins can help energize you, too, so that's another plus. The G-Chews are an A+ product. They taste good, and right away I noticed the positive effect they had during my run. If you're curious about trying G Series Chews, I urge you to give them a try, at least for a few key workouts or competitions. Each chew is a small square and come six to a pack. The directions say to take them 15 minutes before an activity. It's nice that an exact time is given since another company's equivalent product offers just a vague timeline. Flavor-wise, it tasted a little salty-sweet, but neither taste is overly prominent. The consistency of the chews is thick and gummy, but not sticky to the touch. Don't make the mistake of refrigerating the chews, though; I did this by accident and it made them pretty difficult to chew. Fifteen minutes before an evening 3-miler, I ate the fruit punch chews. At the halfway mark, I noticed the positive effect the chews had on my muscles. 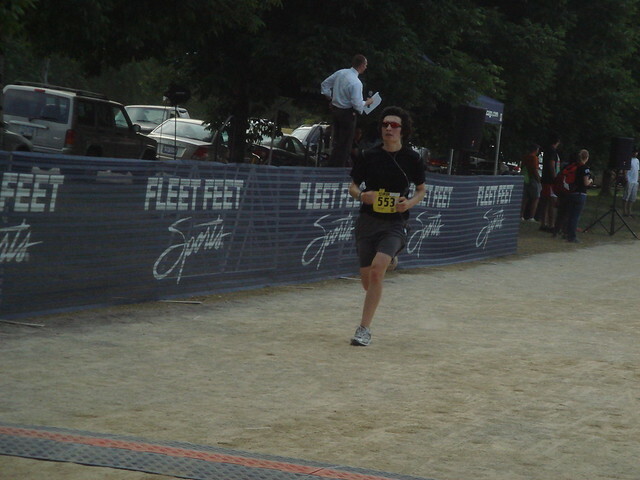 My legs didn't feel fatigued and had a sensation of wanting to run faster than I knew I should, so I reigned myself in. I ate the remaining pack before my 5k on June 2nd. Again, I noticed a positive difference in my race. Instead of struggling to increase my pace during the end, I had enough energy remaining for a nice sprint across the finish line. Mark it down as another positive experience from the G Chews. 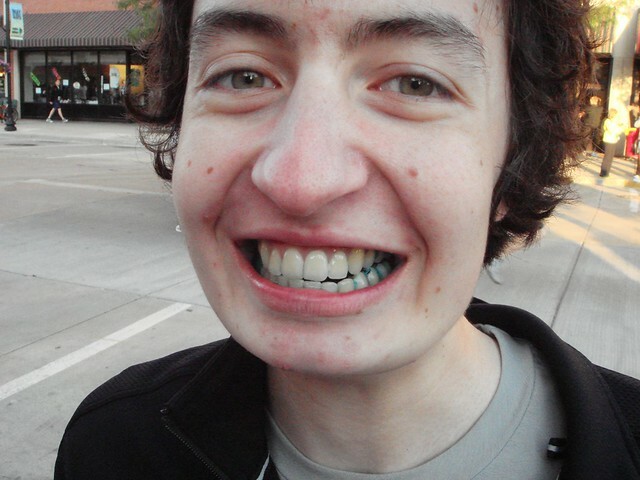 Just like my brother (minus the blue teeth), I noticed that the chews staved off fatigue during the end of a challenging bike ride. It was windy, there were hills, but I didn't feel drained during the last few miles like I've felt during similar rides. If I ever start running again, I'd be interested in seeing how they work for me then. Want to try the chews for yourself? 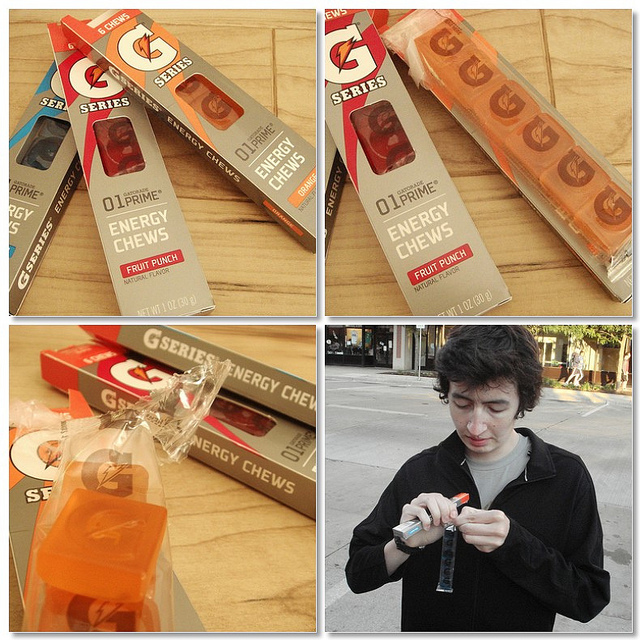 Gatorade is offering one of my readers the chance to win a full case of G Series Energy Chews! That's quite the prize, folks. Leave a comment and tell me when you'd try the chews. 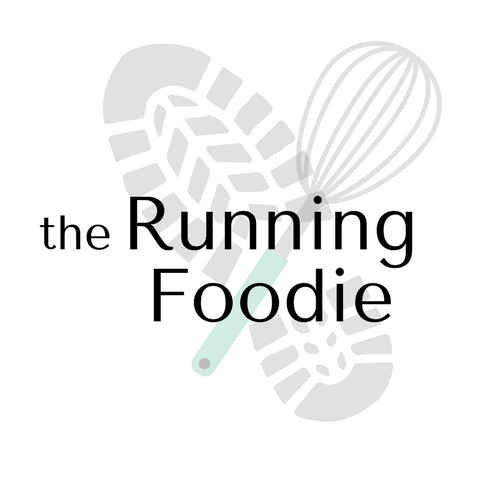 Tweet this giveaway, including a link to this post and @runningfoodie. Leave a second comment to let me know. The giveaway is open to US readers and ends Thursday, June 14th. Good luck!